Science fiction often features technology that inspires future inventions. Cell phone inventor Martin Cooper claims the communication devices used on Star Trek motivated him to invent cellular phones. Harry Potter has an invisibility cloak and the Romulans in Star Trek make their starships disappear using cloaking devices. This fictional technology has inspired scientists to try and make invisibility a possibility. In fact, recent developments in nanotechnology could make invisible cloaking a reality in the near future. We see things because light reflects off objects. Black objects absorb light and this absence of light is seen as darkness which also helps us to detect objects. For an object to become invisible it cannot reflect or absorb light. If light could be bent around an object without any reflection or casting of shadows then we would not see it. Ideally, we would only see what is directly behind the object. It sounds strange but scientists have created a new class of matter that can do this. Metamaterials are nanostructures that have a negative refractive index, which means they can control how light waves are bent, reflected and absorbed. But these meta-materials were limited in size. They couldn't be made larger than a few microns and only manipulated certain frequencies of light. So they could only make invisible what you couldn't see anyway. However, a team of scientists at the University of Central Florida have discovered a method for creating "large-area fabrication" of these meta-materials for the full spectrum of light. As described in their research published in the journal of Advanced Optical Materials, this means that any object covered in this fabric would become invisible. Advances in microelectronics is making yesterday's science fiction into tomorrow's future inventions. Scientists at the University of California have implanted beetles with miniaturized electronics that allows the insects to be controlled. Research presented at a conference in Italy demonstrated a new technology for creating "cyborg insects". The flying beetles receive wireless signals from a mobile transmitter that controls the insect. Varying impulses trigger an appropriate response from the beetle so that it flies according to it's handler. The insect can be made to take-off, land, hover, or follow a given flight path. Previous research concentrated on moths but giant flower beetles were easier to operate and could carry larger payloads because of their size. Further advances with nanobots and miniaturization will allow heat sensors and cameras to be embedded into the bugs. The insect could then be used for surveillance or search and rescue missions. L Bruce Jones is a submarine inventor who designs and sells private luxury submarines. Following in the footsteps of his rocket scientist father, and his grandfather who invented self-elevating jack-up rigs and created the world's first containerized shipping company; Bruce has invented the world's first undersea resort. Accessible by two elevators from the surface, the resort is being built on the seabed surrounding a private Fiji island in the South Pacific. The underwater facilities will include 24 luxury state rooms, a restaurant and bar, library, conference room, wedding chapel, underwater spa, and the ultra-luxury Nautilus Suite with stunning undersea views. One of the future inventions that could greatly impact our lives are nanoribbons. Rubber films developed by engineers at Princeton University could power mobile devices and other electronic devices. The silicone sheets are embedded with ceramic nanoribbons (piezoelectric ribbons) that generate electricity when flexed, converting mechanical energy to electrical energy. Materials made of this material, such as shoes, would harvest electrical energy created from walking and power everything from an ipod to a pacemaker. The nanoribbon strips are so narrow that 100 strips fit side-by-side in a space of a millimeter. The strips are then embedded into clear sheets of silicone rubber to create a chip. These sheets could be woven into fabric and placed against any moving area on the body to create electricity. For example, a vest made from this material could take advantage of breathing motions to generate energy. Nanoribbons are highly efficient in converting about 80% of mechanical power into electricity. This future invention is a device for delivering medication and vaccinations through the skin. As an alternative to injecting a needle, micro-poration is a painless method of transferring medication (intraepidermal) into the body using laser technology. A handheld laser creates micro pores in the epidermis of the skin for the transfer of molecules. It has a familiar comparison to the "needle-less" device used by Dr. "Bones" McCoy on Star Trek. The popular sci-fi series has inspired more than a few new inventions including the "laser" and the cell phone. This new micro-poration technology is painless to use and requires no supervision to administer. The interfaced controls regulate the dosage. 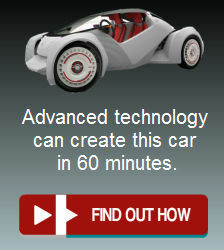 Scientists at Standford University are developing future inventions using e-Texiles. This new class of flexible, stretchable and lightweight clothing would function as rechargeable batteries. Cotton and polyester fabrics are dyed with an ink made from carbon nanotubes, which are electrically conductive carbon fibers that are 1/50,000th the width of a human hair. The electronic properties of the fabric are maintained even when the clothing is washed. Researchers believe that the e-Textiles will eventually allow us to use our clothing as gadgets - talking to a friend through our shirt sleeve or surfing the web on a pant leg. One of the future inventions in health care may be the development of a spray gun for regenerating skin tissue.The Armed Forces Institute of Regenerative Medicine (AFIRM), recently established by the U.S. Department of Defense, is funding research into the regrowth of bones, muscles, tendons, nerves and blood vessels. The University of Pittsburgh's McGowan Institute for Regenerative Medicine will join a consortium of 30 institutes in regenerative research. Last year, a pathologist at the McGowan Institute regrew the severed fingertips of two patients in their mid sixties. Existing scar tissue was removed by an enzyme. Scarring inhibits regrowth, however cells derived from pig bladders can override the scarring process and attract cells and proteins needed for growth. Another researcher with Wayne Forest University, is developing an inkjet device with cartridges containing tissue cells with growth factors. The device would dispense layers of tissue onto deep flesh wounds for healing and regrowth. For surface wounds, a hand-held sprayer is in development, which sprays immature skin cells (called keratinocytes) onto the skin. Clinical trials with burn victims have been promising. The advantages of this technology compared to "grafting" is that it eliminates patchwork scarring and uses less skin. "Conventional methods cannot return people to the way they were before" says biochemist Alan Russell, but it's within the grasp of science. Among the future inventions in e-readers is this paper thin, flexible film that reads like a magazine or newspaper. LG Display, a manufacturer of thin-film transistor liquid crystal display panels has developed an 11.5 inch flexible e-paper display. The 0.3 mm thick metal foil substrate resembles a traditional newspaper but operates as an e-reader. The GIP (Gate-in-Panel) technology promises to be the next generation in digital display technology competing in the e-book market. E-paper's ultra-thin, flexible and lightweight form reduces maintenance and power consumption costs but its scalable size encourages additional applications such as mounting to flat and curved surfaces like walls and pillars.